A legislative committee has taken the unusual step of giving immediate approval to new rules for how workplace misconduct complaints are to be handled in state government. Iowa Department of Administrative Services director Janet Phipps began drafting these changes a month ago — after an independent report was issued about sexual harassment allegations against the former director of a state agency who was fired by the governor in March. The Weinhart law firm’s report indicated the state’s employee handbook was unclear and employees could fear a complaint about harassment from a boss would be handled by the accused harasser. 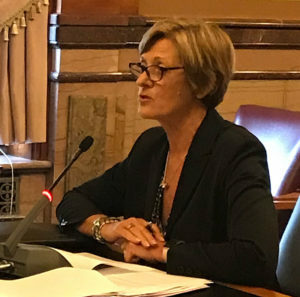 The new rules make it clear the Iowa Department of Administrative Services will handle all complaints made by state employees, unless the person makes their complaint directly to the governor’s office. Matty Smith of the Iowa Coalition Against Sexual Assault said the rules lack clarity on how and when the agency will conduct an investigation. “There should be more meat on the bones in these rules,” Zeno said. The new rules, which go into effect today, were approved unanimously by a hastily convened legislative committee. Nine of the 10 members of the panel joined the meeting by phone. Senator Mark Chelgren, who convened the group, used the word “unusual” a few times to describe the situation. “I’d like to thank everyone for coming in on such short notice, for calling in on such short notice,” said Chelgren, whose voice was heard from a telephone conference system set up in a statehouse committee room. Advocates for openness in state government say they’re reviewing sections of the rules which say complaints and all records related to complaints are confidential and may only be released to the public by court order. The director of the Administrative Services Agency told reporters today that’s current practice.